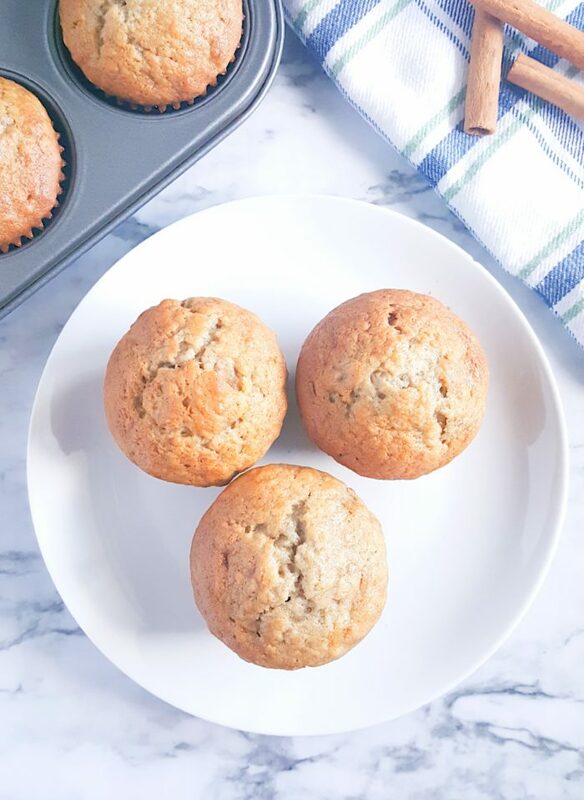 This easy, foolproof, dairy-free recipe for homemade banana muffins is the best I’ve ever had! These muffins are moist with big muffin tops and loaded with banana bread flavor. Customize by adding chocolate chips, blueberries, or nuts, or sprinkle them with cinnamon sugar. Grab those overripe bananas and get baking! I’ve tried my fair share of banana muffin recipes but this is, hands down, my favorite. After having these once, you’re going to make them again and again because they taste so good and they’re so easy to make. And you can’t mess these up because like the title says, this is a foolproof recipe. Many banana muffin recipes turn out to be banana cupcakes but these have the texture of a muffin. Big tops, thick crumbs, hearty and not overly sweet; just the way muffins should be. They’re slightly crisp on the outside, thanks to the granulated sugar, and they’re soft and fluffy on the inside. I’m a brown sugar muffin kinda girl but granulated sugar works so well in these. 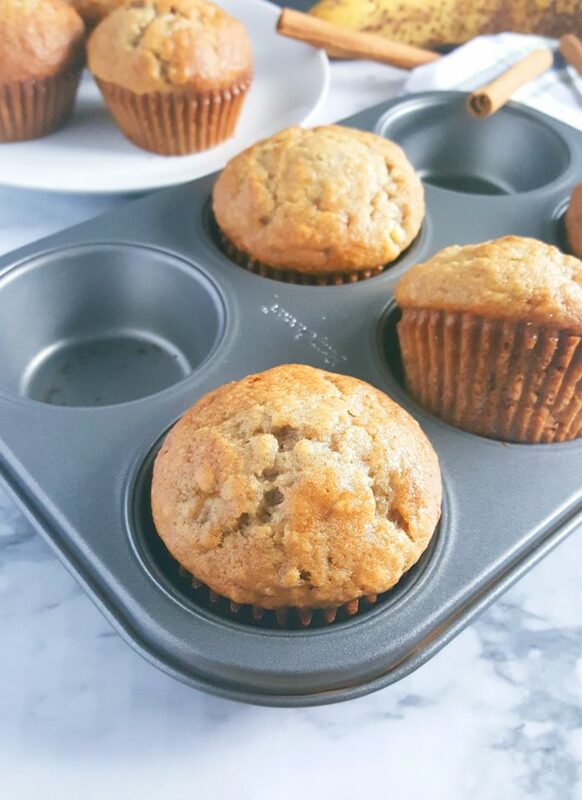 If you have bananas withering away on your counter I have come to save you with this easy recipe and if you don’t have any bananas at all you better go get some, because these muffins are ready in 30 minutes, from start to finish. This is also a one bowl recipe because we don’t need to be mixing ingredients separately and all that because that’s an extra bowl you have to wash and that is one bowl too many. In my household bananas are a staple. Whenever I go to the grocery store I always pick up a bunch or two. I buy so many bananas but surprisingly they never end up in the freezer or the garbage. They always end up in bellies. I had four overripe bananas just chillin’ in the kitchen, which was perfect because I used three for the recipe and put that last one in the pictures. These bananas had quite the journey and they were highly demanded. I had to move them from the shelf to the counter, and then I had to hide them in the cupboard because my kids kept asking for them. They absolutely love bananas but I had baking to do. They got pretty mad because as the days went by I kept telling them that I need the bananas for a recipe but yet they weren’t being used like I said they would. So I don’t blame them for being a little upset. I was stalling because I had to make sure that this recipe was perfect! I am so done with testing a recipe four-five times. Done! That is in the past. Now, before I even think about baking I sit down and take a good look at the ingredients, and I make sure that the ratio of wet to dry is spot on. Hell, I even imagine what the batter is going to look like. I think about the fat, the moisture, and the perfect temperature according to how I want the damn things to turn out. 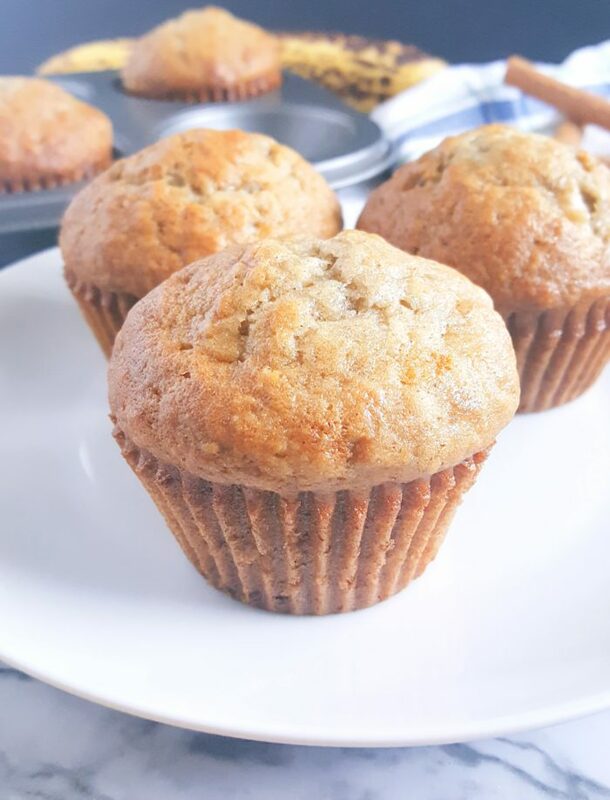 The inspiration for these muffins came from me just wanting my own banana muffin recipe. Yeah, I know that’s a weird thing to want but I have the mind of a creator and I wanted banana muffins that tasted and looked exactly the way that I wanted them to. 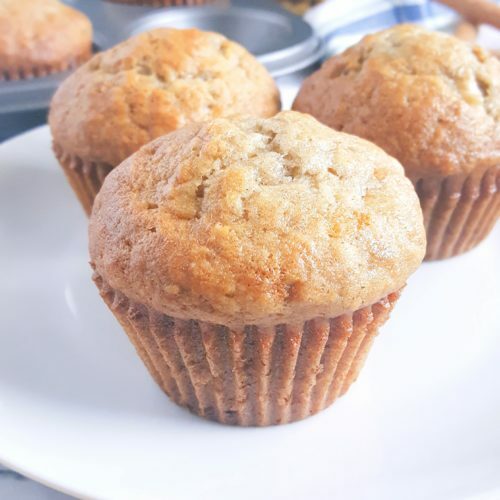 I wanted them to rely mostly on the bananas for moisture (instead of butter or oil), I wanted them to be dairy-free, and I wanted them to be as close to bakery-style as possible. I’m happy to report that I am very pleased with the results. Actually, I’m more than pleased because they taste better than the banana nut muffins I get at the café up the road. You guys should’ve seen my reaction when I pulled these out the oven. They were so beautiful. Golden brown tops with these little cracks and they smelled amazing! These babies are ready when a toothpick inserted comes out with wet crumbs. Yes, I just said “wet crumbs” and not “clean” because you wanna keep some of that moisture. I baked mine for 19 minutes. There are subtle notes of cinnamon and banana bread flavor in every bite. The exterior is slightly crisp and the inside is fluffy and moist. And you can customize these however you like. Add chocolate chips, blueberries, nuts, or slab on some butter! If you know your mom has some kinda top secret streusel recipe this is the time to ask her for it. These would be great with some extra crunch. Sprinkle on some cinnamon sugar. 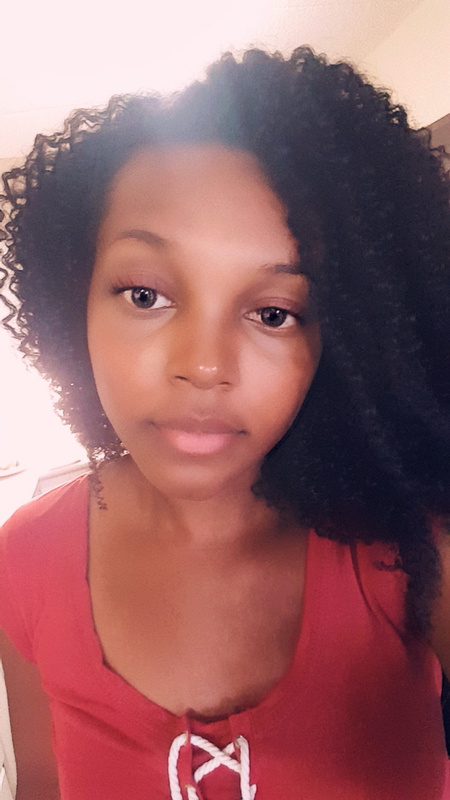 Yes, I know that got your attention. You know what I love to do sometimes? Drizzle them with maple syrup. We all know maple syrup goes so well with bananas. I promise you though, whatever you decide, you can’t go wrong. If you have coconut oil on hand use that instead! You will not be disappointed. Just make sure that it’s in its liquid state. I don’t like waking up in the morning, but I will wake up for these. I will jump out of bed and sprint to the kitchen for these banana muffins. They’re that good. Can you believe that there was a time when I used to skip breakfast? Isn’t that sad? I used to skip my favorite meal of the day and miss out on muffins like these Mini Blueberry Banana Muffins and these Double Chocolate Banana Brownie Muffins. Never again will I be doing that. I always eat breakfast and you should too. You can always make these banana muffins the night before and have them in the morning. Also, I used to buy banana muffins from the store all the time. I got some the other day and they tasted like crap. I can’t believe I used to eat those things. They taste so artificial and innutritious. I took a good look at the ingredients and I couldn’t even pronounce half of them and the sugar amount was through the roof. This is another reason why I wanted to come up with my own recipe. 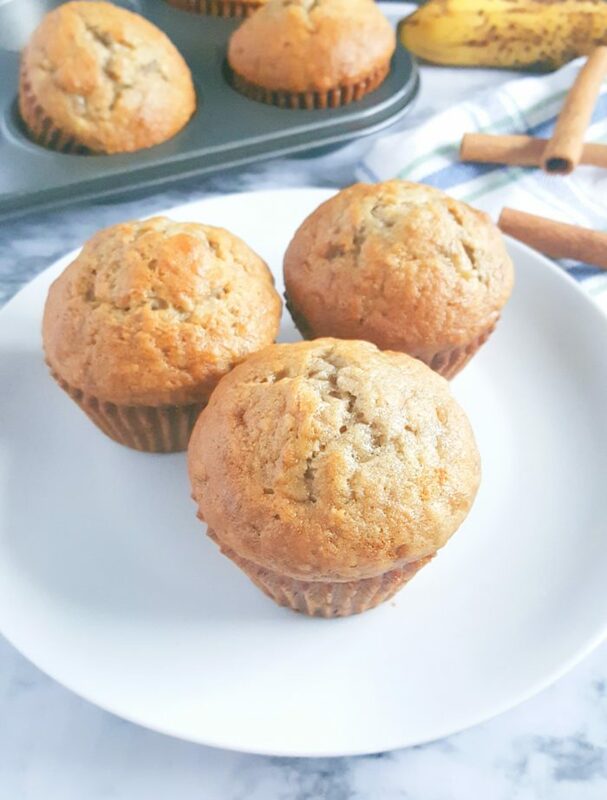 Never wasting my money on those again and you shouldn’t either because these homemade banana muffins are the best! And they’re kid-approved too. I definitely did not have to beg my kids to eat these. They loved them and they asked for seconds, and thirds, but two is enough for those little piggies. The minute I was done taking the pictures these muffins were demolished. Not a crumb in sight. They were literally gone in one day. We had nine for breakfast then the last three after dinner. Those last three were just staring us in the face, even though they were covered up and in the cupboard. Okay, I guess we’re just a bunch of muffin addicts. They just smelled so good I couldn’t resist. After you cover and store them (if they last that long) they will lose that crisp exterior, however they’ll still be moist and just as flavorful. 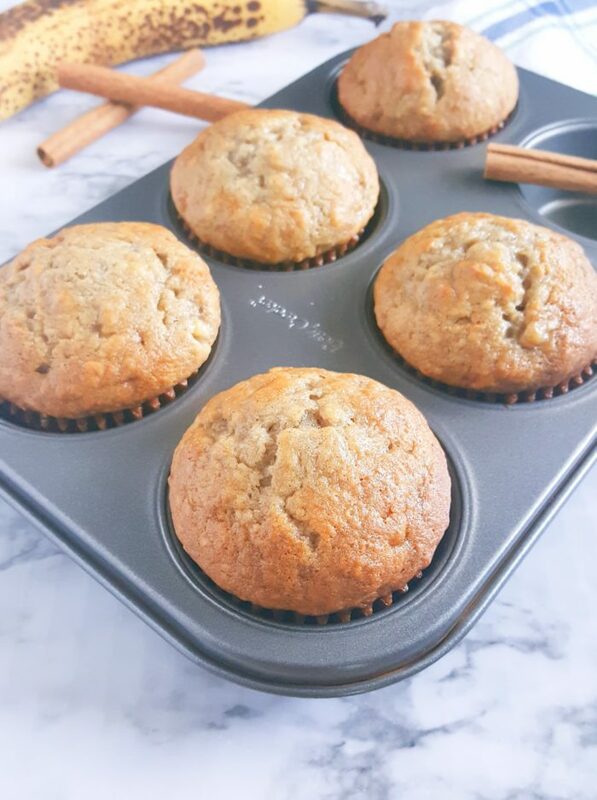 If you love banana muffins but are looking for something more on the healthy side check out these healthy banana applesauce muffins. They’re made with whole wheat flour, oil and butter free, and they’re even softer than these ones (believe it or not). Raw bananas taste okay but baking them is way better so grab those overripe bananas and give this recipe a try. It just might be your new favorite! Preheat oven to 375°F. Line muffin pan with muffin liners and set aside. In a large bowl combine bananas, sugar, cinnamon and salt. Beat in oil, eggs, and vanilla extract. Add flour and baking soda, and gently mix until combined. Scoop batter into the muffin pan distributing it evenly between the muffin cups. Thank you for this wonderfully simple recipe! I made them this morning and the family absolutely loved them. So easy, so quick and so yummy! 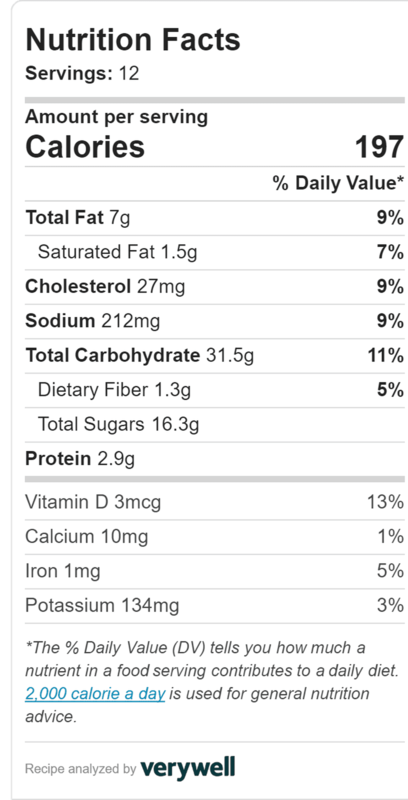 I calculated the nutritional value and each muffin is less than 200 calories, less than 3 grams of fat, 20 grams of sugar and 3 grams of protein…not too shabby for something so yummy! Thanks again for this wonderful recipe! Wow, I didn’t even know that. Thanks for this recipe. I don’t like banana muffins but these are so delicious. My grandson and daughter just Love these. I’m so glad you liked them Renee! Thanks for stopping by and leaving a comment.